A few posts ago I was searching for the origin of an old story. Part of that search took place in the Annales, or a Generale Chronicle of England. The Annales is a list of events that John Stow (~1525–1605) compiled from his own notes and earlier sources. It begins with mythic/prehistoric Britain, and ends (in the 1603 edition) with the death of Elizabeth. That post described what I found in the book, but I didn’t tell you the whole story. I left something out because it wasn’t relevant to what I was discussing. But even more than that, it was just too damned annoying. It still is, but now I’m in the mood to tell you anyway. When I found the 1603 Annales, I was hunting entries for early 1576, when I returned to England from the Continent. So I scrolled near to the end of the book, and I started reading where I landed. It was almost random. This was the first item on the very first page that I read. It’s from 1578. The 31 of May, Martin Frobisher with 15 sail of good ships, manned, victualled, & other ways well appointed departed from Harwich in Essex, on his 3rd voyage towards Cataya [Cathay – he was searching for a Northwest Passage to China]. And on the 31 of July, after many attempts, & sundry times being put back by Islands of ice in his straits, he recovered his long wished port, & came to anchor in the Islands, newly by her majesty named Meta Incognita, where (as in the year before), they fraught [freighted] their ships with the like pretended Gold ore out of the mines, & then on the last of August returning thence, arrived safely in England about the first of October, but their Gold ore after great charges proved worse than good stone, whereby many men were deceived, to their utter undoings. Here’s the annoyance: I was one of those undone men. I lost £3000. Three. Thousand. Pounds. If you don’t realise how much wealth that was back then, click the link for some comparison figures. 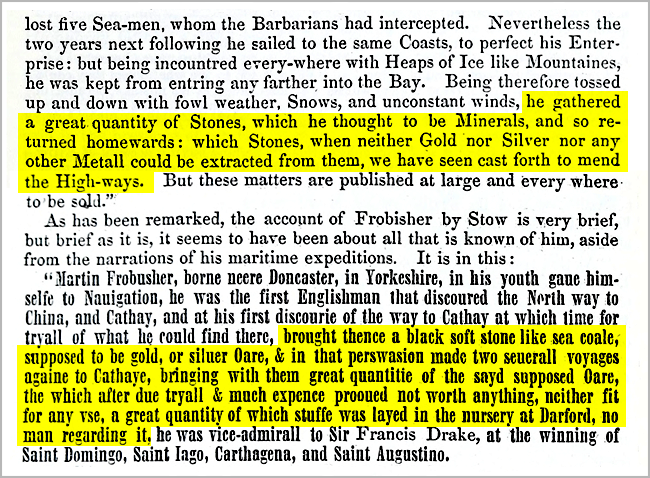 In 1577 I had put £25 into the second expedition, which came back with 200 tons of what the assayers were certain was gold ore. So I was all in for the third trip in 1578. A sure thing. I sold three manors to raise the cash. The ships returned with 1350 tons this time, but while they were still away the ‘experts’ changed their minds. Of course when the ships got back the new rocks were no more valuable than the old rocks. They were only more numerous. I was nearly mad with worry for a while, over this financial catastrophe. It was not a good time. Register, ‘Memoirs of Sir Martin Frobisher, Knight’. See end of post for source details. Most of the rubble ended up as road paving in Dartford. It’s probably still there, buried far under the macadam. Dig some up and test it. If it turns out to be geologically Canadian, I paid for it. Two years later (1580) I watched as Christopher Bloody Hatton – whose heraldic crest (and a sizeable investment) prompted Francis Drake to re-christen his flagship the Golden Hind – cleared £2300 profit when Drake returned after circling the globe. Pirated Spanish gold, all of it. No rocks. Frobisher failed in 1578. I died in 1604. Four centuries passed. In late 2015 I got online, and on 13 March 2017 I opened the digitised PDF of the 1603 Annales. My fiscal fiasco, 439 years old, was right there to annoy me all over again. What are the odds? I didn’t invent my stuff out of whole cloth, you know. Everything had a source, an origin point in reality that sparked my imagination. The work’s no good otherwise. This applies to anyone’s work, not just mine. But especially to mine. North North-West, in Hamlet? Frobisher, and my maddening misfortune. Posted on 26 April 2017 6 June 2018 by @edevere17Posted in Hamlet, History, Personal Stories, Shakespeare, The Merchant of VeniceTagged Alfred Hitchcock, Canada, Christopher Hatton, Francis Drake, Heraldry, Insanity, Internet Archive, John Stow, Martin Frobisher, Money, Peeves.